Dutch yard Heesen Yachts has revealed that Project Triton has now entered the outfitting stage, following the joining of the hull and superstructure. 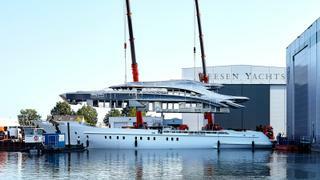 The construction milestone took place on September 1 at the yard’s Oss based facility and the 500GT yacht remains on track for a February 2020 delivery. Designed and engineered in-house, Project Triton is the second new 50 metre Steel Class and will be the sistership to the Omaha, which was delivered in July. The yard said that the “curvy flowing forms” of the exterior lines by Clifford Denn are inspired by classic car design. Meanwhile the interior design by Reymond Langton is a “linear and clean environment” with a “geometric theme”. Described as “a true bluewater motor yacht”, Project Triton will accommodate 10 guests in four large staterooms, and a master stateroom on the main deck. Multiple tenders and toys will be stored on the main deck while a luxurious beach club will be equipped with a backlit bar. 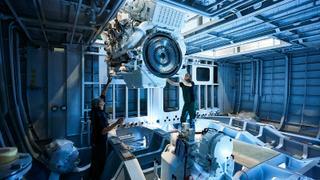 Power will come from a pair of MTU 8V4000 M63 diesel engines of 1000kw for a range of 3,800 nautical miles at 12 knots and a top speed of 15 knots.